If he is, you can bet it'll be so artistically done. 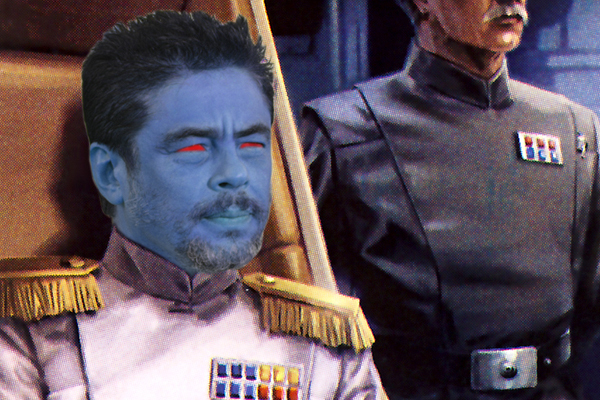 It's official (pretty much) - Benicio del Toro is the villain in Star Wars Episode VIII. Lucasfilm are yet to officially announce it, but the actor himself - who has been pretty vocal about his interest in the film - has now said he's properly joined Rian Johnson's sequel to The Force Awakens. Back when reports first hit I pondered what this meant for the impending The Force Awakens, but now let's put aside all that rampant speculation over what a new villain means for the fates of Kylo Ren, General Hux, Captain Phasma, Supreme Leader Snoke et al come December and instead look ahead to what exactly we can expect from del Toro's character. 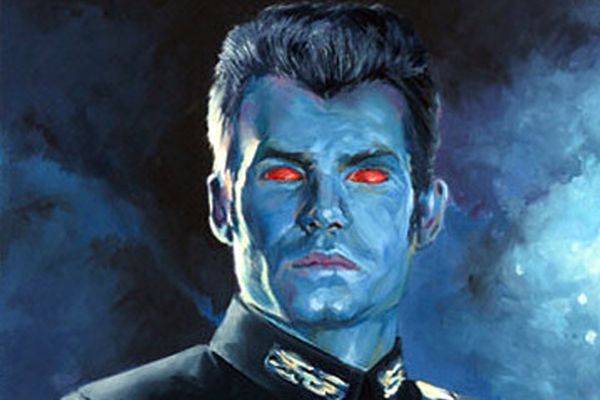 Namely, one particularly exciting (and incredibly crazy) prospect - is he playing Grand Admiral Thrawn? Details on Episode VIII are scarce, but when you take a step back and consider everything this is just about as logical as your next bonkers fan theory. So let's break it down and take a look at just how Thrawn could fit into the new Star Wars trilogy and why del Toro may be playing him. 6. Just Who Is Grand Admiral Thrawn? Spellchecker's gonna have a riot with this one. Grand Admiral Thrawn (Mitth'raw'nuruodo to his friends) was the chief antagonist of Timothy Zahn's Thrawn Trilogy (Heir To The Empire, Dark Force Rising and The Last Command), three of the most highly revered Star Wars books ever written. Set about ten years after Return Of The Jedi, they chart the attempts by Luke, Han, Leia and co. to build the New Republic in the face of the threat of the Imperial Remnant, led by Thrawn, who assumed the role of Grand Admiral after Palpatine's death. A cold and calculated tactician, Thrawn felt unique amongst the cowering and snivelling Imperials that littered throughout the Original Trilogy, the natural sort of threat to rise from the Empire's ashes. Thanks to the quality of his novels, and in particular Zahn's writing of their villain, he's become a firm fan favourite, long hoped to make the leap from print to the big screen. In terms of the character's enduring appeal, it's important to understand the context of Zahn's novels. They came at a time in the early nineties where Star Wars was, for lack of a better phrase, winding down. The movies had been absent for almost a decade, toy production was stagnating, tie-in material (Marvel comics and the Ewoks/Droids cartoons) were finished and George Lucas had moved onto different (but by no means better) things. It was a crucial point in the series' history - had things gone a bit longer without something to rally fans, it's conceivable Lucas may not have seen much worth in going back to tell the prequels. I'm not going to suggest that Thrawn brought Star Wars back, but he was a key turning point in the series becoming the immortal mega-franchise it is today. But, through all that, he's just a genuinely great character, evidenced by how his popularity endures over twenty years after his first appearance.